DOGS PERMITTED? Dogs are NOT permitted at this property. Tucked under the spruce trees and nestled in a quiet cove facing the deep Atlantic and several islands, the views from Deep Cove Cottages are spectacular. This is a great pair of cottages (Yes! Both cottages are included! ), with a screened-in, three season porch for two couples that want privacy, or a family getaway. 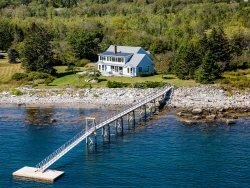 Surrounded by plenty of flat yard space, this property is a great spot to toss a Frisbee, watch lobster fishermen, or take in your favorite book. The addition of the screened-in, three season porch off the kitchen of the main house provides a new way to enjoy the outdoors during the days and evenings. The comfortable space includes a living area and a dining area with views of the ocean, a field, wetlands, and woods. On hot summer days, the breeze flows through unobstructed and on chillier evenings in the fall it provides protection and warmth without sacrificing any of the views. The furnished upper deck is accessible from the master bedroom, enjoy your morning coffee with incredible views of the water. Stairs lead to the rocky shore in front of the cottage. There is a deep-water mooring just offshore for those who want to bring their boat. Kayaking is possible from shore, as is just sitting back and relaxing on the large special cupped rock at the base of the stairs to the beach. BOATS INCLUDED? None, however Port Clyde Kayaks, just down the road, offers Kayak and SUP rentals. LINENS & TOWELS: The rental of this property includes all bed linens and towels. Beds will be made up upon arrival and there will be one bath towel and washcloth per listed occupancy, two hand towels per bathroom, one bath mat per full bathroom, and two kitchen towels in the kitchen. Additional bath towels can be rented. Cleaning: The property will be cleaned before and after the rental. Above normal cleaning charges will be billed to guest at $35 per hour. On the Water in Maine in certainly easy to work with and are very clear with what the expectations of the renters are.the do an exceptionally fine job! We spent a great week at Deep Cove Cottages. The view is perfect and both of the cottages are charming and well appointed. I have seen this property listed for several years and I knew we had to spend some time there. Our expectations were certainly met! Very easy & direct to deal with. No surprises & the reservation process & billing is just as advertised. The new porch & deck above it are great additions to the cottages. We had meals out on the porch, soaked up the early September sun on the deck & enjoyed the new vantage point of the cove. Love it! We've rented from On The Water In Maine for many years, and the firm has always been the best. Excellent -- as always! The new enclosed porch and roof deck are wonderful additions to the property. Fantastic working with your company, everyone was so pleasant and helpful. House was amazing, we loved it! You guys were great, thanks. Always the professionals, it seemed everything was meticulously cared for and orchestrated. Instructions were clear, tourist opportunities available in the many brochures and pamphlets left in plain view. All went smoothly and comfortably. I loved it all! The 2 cottages are charming, comfortable and well situated with lovely views of the cove and islands. It felt like the real Maine - seaweed, water, rocks, meadow next door, spruce trees encircling the property, boats on the water, and that deliciously fresh sea breeze. It was quiet and peaceful. The staff at On the Water in Maine are so helpful and make everything so easy! Paige was great to work with during the reservation process. She made everything easy and worry free. Thanks! This is our third year staying at Deep Cove Cottages and once again it was wonderful. The new sun room and balcony were great additions to the property and we enjoyed using them! The cottage is so private and quiet and makes for a relaxing vacation. It is also located very close to Port Clyde (great ice cream shop! ), Marshall Point Lighthouse and Drift Inn beach. Rockland is a short drive with great shopping, galleries and restaurants (Home Kitchen Cafe is a favorite). We so enjoyed our time at the cottages and will definitely return! I rent through OTW each year! We are so happy with the way the process works! We already have another week in August planned! The location is very quiet! The view is amazing! We watched the watermen gather their traps each morning! We shared Deep Cove cottages with another retired couple. We all could not have been more impressed with both the cottages and the ease of working with "On the Water in Maine". I have rented homes, condos and bed and breakfasts in Hawaii, Europe and elsewhere and found these cottages to be exactly as represented and spotlessly clean. I do not sleep well anywhere, but the beds were very comfortable and I slept exceptionally well. All the essentials were there and we were able to buy lobsters from the dock in Spruce Head inexpensively to steam almost every night. Within a 30 minute drive to everything from bakeries( in Port Clyde and Tenants Harbor 2-4 miles) to Camden and Rockport sailing excursions. Weather was perfect. The phone and internet were spotty in the evening hours sometimes, which was of small consequence, considering the fact that we had the BEST VIEW EVER! Booking with On the Water in Maine is always clear & easy to do online. Enjoyed another lovely week at Deep Cove. It's now a family & friends' September tradition. Thank you! Nothing has changed over the years: On the Water in Maine is still the best vacation house rental service we've ever worked with. On the Water in Maine was very helpful in answering questions and very understanding when we arrived late and tired and had a little trouble opening the key lock box. The cottages were clean and well appointed. Great location with beautiful views of the inlet. Clear instructions make following the rules easy. Peaceful setting. Well maintained cottage. Our second stay at Deep Cove. Our experience working with your agency, was professional. We had no problems. We were very comfortable during our stay. As well for my daughter in the smaller cottage. The one thing I found that there wasn't hooks for wet towels in the up stairs bathroom. I ended up hanging damp towels on the chairs up stairs.Our daughter said that the cottage lacked hooks as well. Also in the little cottage, there were a lot of spiders in the bathroom. Finally it would be nice if there was a path from the parking space to the back door. All four of use felt that Deep Cover Cottages were wonderful! Very clean,comfortable, and well stocked. We all were very happy there!!! We had a very positive experience again this year with the On the Water in Maine agency. Tiff and Nicki answered all our questions and were so helpful!! We had a great time during our stay at Deep Cove Cottages! We love the property and the view from the cottage is spectacular! The cottages were very clean and the cottage is close to Port Clyde and the Marshall Point Lighthouse. It was a very relaxing two weeks in Maine! We enjoyed visiting Port Clyde, the local lighthouses, Drift Inn Beach, Rockland and Camden. We loved our visit to Acadia National Park and Portland. The location of the cottage makes it convenient to day trips. It was just what we were looking for, to celebrate my wife's birthday. The On the Water staff was friendly and efficient which made for a worry free relaxing vacation. The Deep Cove rental property was spotless and well equipped which made for a pleasant stay. We have been renting on the coast of Maine for over 25 years - Deep Cove Cottages is at the top of the list for location and quality. We hope to return next year. Staff at On the Water in Maine was wonderful and a joy to work with! The cottage was beyond our expectations. We came to relax and de-stress. Immediately after our arrival the scenery alone melted all the stress away. We enjoyed the weather, the view and watching nature all around us: loons, ospreys, harbor seals, and adorable squirrels that kept us entertained. Justin was available to answer any questions. Very professional & personable. Exactly what was expected. Very quaint, clean, well appointed, quiet, with an amazing view. Added bonus of having kayaks available. Enjoyed the selection of books & CDs. Liked not having a tv, although we did watch a VHS movie, very retro. On The Water In Maine could not be better. It's the best vacation rental company we've ever worked with. Our stay at Deep Cove has become an annual visit. We love the house, it's privacy and exceptional location. Primarily a fishing and lobstering community, St. George is made up of several distinct villages Clark Island, Wiley's Corner, Martinsville, Tenants Harbor, and Port Clyde. Although the harbor villages of Tenants Harbor and Port Clyde are the best known (and most visited), you'll find dining facilities, art galleries, and small businesses all along the diverse and beautiful coastal town.